Blurb: "A warming Scandinavian blend of black tea with cinnamon, ginger, cloves, orange peel and almond pieces". Anyway, Glogg is a delicious smelling tea - a product of the variety of spices and flavours it contains. 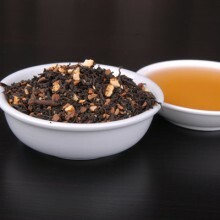 The picture to the right is not the exact same one I have (different brand), but the appearance is very similar - mixed in with the black tea leaves are big chunks of almond, orange peel and cloves. Smelling it in its dry form reveals a strong cinnamon aroma, with the cloves also noticeable. Glogg is a very smooth tea - even an extended infusing period (I left mine for over five minutes) does not turn the cup bitter or sharp. Not surprisingly, the smell of the brewed cup is significantly weaker than the dry tea, but brewing brings out the ginger aromas along with the cinnamon. Cinnamon is probably the dominant flavour other than the tea leaves themselves. The cloves are not particularly evident, flavour-wise (probably just as well, most people would think), but the orange peel does add a touch of citrus, and of course works well with the subtle ginger flavours. In fact, the combination of flavours works well as a whole. The list of spices might look like a mash of too many things, but the overall tea is actually quite low-key. Glogg is not weak, but it is a finely balanced flavoured tea - unlike some flavoured teas, its aroma and taste both are pleasant without hitting you over the head. I recommend Glogg to those who would like a black tea that's a little different but quite delicious.